Newark may have only been a few days ago but there’s still no rest for some members of the regiment as we move swiftly on to our next two events. On Sunday 1st July we will once again be commemorating the battle of Marston Moor with the annual march and service that takes place at the monument to the battle. Although this event doesn’t have a camp or battle, members of the public are welcome to watch along the route. We will be forming up at the Boot & Shoe Inn, Tockwith from 2pm and marching off promptly at 2:30pm. From there the march will go to the monument where a short service will be held to commemorate those who lost their life there, on 2nd July 1644. It’s at this time that the modern day regiment also remember those who have passed away from our own ranks. Newcastle’s regiment were there on the day of the original battle, it was one of the most important battles in the history of the original regiment, so we feel it’s very important for members of the regiment to be present at this annual event, hence why we choose to commemorate our own members there. No sooner will Marston Moor be complete, it will be onto our next event, number 4 in a row for a few of the regiment! This time we’ll be off to Bolton School to take part in an event commemorating the Storming of Bolton on the 7th and 8th of July. The event will take place at the school and has been supported by Heritage Lottery Funding. 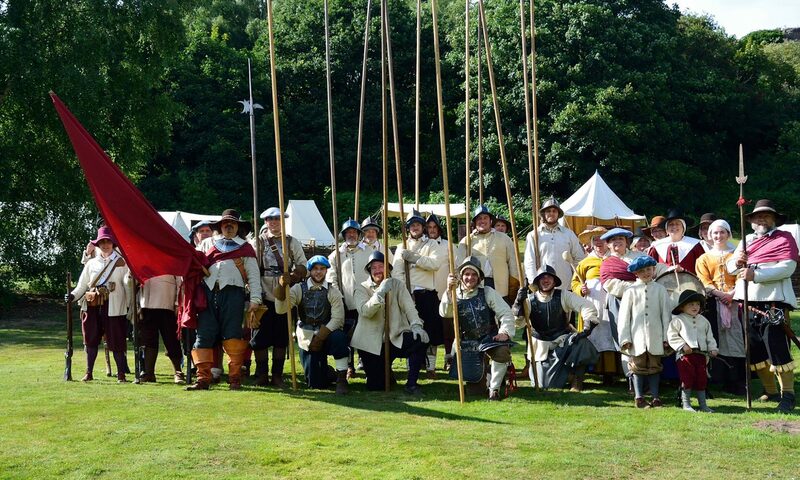 There will be a Living History camp and a range of different displays and cameos before a skirmish depicting the events that happened in Bolton in 1644. The event is free to attend and will be open at the school both days from 10am to 4pm. If you haven’t already seen, we are commemorating a battle that we are unfortunately, not able to re-enact this year, on our social media pages. The Battle of Adwalton Moor took place on 30th June 1643, it was a decisive battle in Newcastle’s fight to retain Royalist control of the North of England against the Parliamentary forces held under the control of Lord Ferdinando and his son Sir Thomas Fairfax. We are retelling all the action ‘live’ on our Twitter and Facebook pages, with lead up events having already been posted on our profiles from the 22nd onwards. Please head to our pages to watch the action unfold. Finally, we have some exciting news about another way you can keep in touch. If you want all of the information about what we’re getting up to as a regiment, what’s coming up and exclusive content that you won’t be able to read anywhere else, we’re pleased to announce our upcoming email newsletter, Cavendish’s Chronicle. You’ll need to sign up for our mailing list here and then you’ll be set ready for the inaugural issue to be published in the next week or so. Don’t miss out! It’s a very busy time for Newcastle’s at the moment but we’ll be filling you in on everything that happened at Newark and the events at Marston next week with more coming up in the following weeks about Bolton and where you can find in the following few weeks. Previous PostPrevious June 2018: What we’ve been up to and what’s coming up.